The Trip (at 12,130 meters). Flying often makes me wistful and pensive. There’s something about being strapped in a 737 flying over varied prairie and mountainous landscapes at 12,130 meters that brings it on. Well, flying in a much smaller Bombardier turbojet between Edmonton and Calgary also got me musing, especially about the place of humans in the world and about time. We had flown from Comox on Vancouver Island directly to Edmonton in central Alberta a few days earlier to visit my sister-in-law who lives in the Dickensfield care home in Edmonton and to see my brother who has recently moved from Regina to Edmonton. The day before yesterday my niece drove us to the Edmonton International Airport for the start of our trip home. At this time of year Edmonton is covered in dirty snow and when it thaws a bit and then freezes again, the side roads can get treacherous, but the highways were clear and the traffic was light. It was 6:30 AM and the temperature in Edmonton was -8 ˚C and steadily dropping. I took the picture below with my iPhone somewhere between Edmonton and Calgary. I don’t know at what altitude we were flying but it couldn’t have been more than 3,000 meters. The patterns created by carving up the prairie into quarter sections is clearly visible in the photograph I took from the cabin. The snow helps delineate the quarter sections. 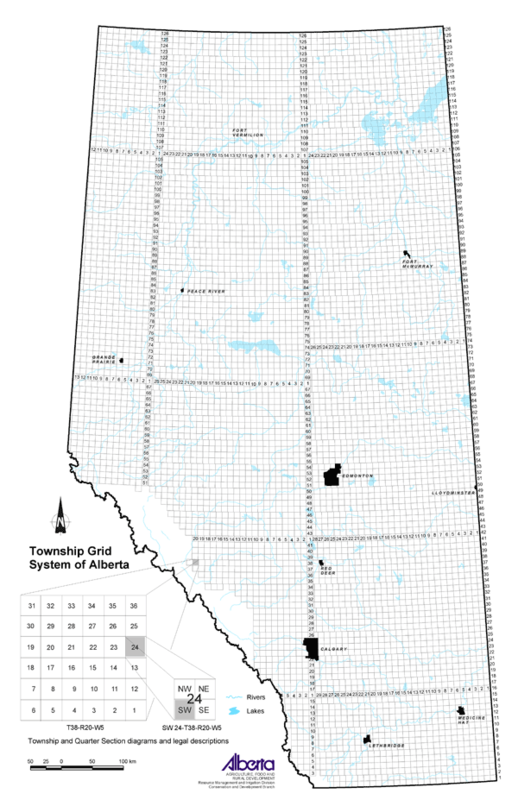 The other photograph is a screenshot of the Alberta township system map that you can find here. Every square inch of the land is marked by human intervention. The symmetry evident in both photographs is superimposed on the landscape and is obviously not natural. Still, the grid is plain to see in the photograph from 3,000 meters up. Fences and tree breaks attest to the surveyor’s work and our penchant to delineate land to own, clearly separate and distinct from our neighbour’s land, forces us to recognize our pretence of dominance over the land. The scars are real. Where is there room for burrowing owls, bison, prairie dogs? In patently very few places it seems. That’s plain to see. Humans have been transforming this landscape for centuries, millennia even, but nothing on the scale of the past 100 years. Alberta is the playground of humans for now at least. Wildlife (freelife) must find pockets of compatible space in the interstices of human culture to build homes and forage for food. In another 10,000 years, the scars that are evident from 3,000 meters up will likely be erased. ‘Alberta’ as a political entity will be no longer. Burrowing owls will likely be extinct. In a hundred million years new species may roam the land. In a half a billion years, the prairies may be lake bottom or the Rockies may migrate further east. The continents as we know them will be undone and redone. I don’t know how the future will unfold in detail. Geomorphologists know about these things, about plate tectonics and the like. All I know for certain is that everything will change radically over time. Regardless, the way we think of time is conceptually extremely limited. Brian Edward Cox OBE, FRS, English physicist who serves as professor of particle physics in the School of Physics and Astronomy at the University of Manchester and BBC documentary commentator argues that the universe is finite and will come and go in the blink of an eye. Our human lifespans are infinitesimal yet we live them as though they are forever. The Prairies and the Rocky Mountains seem forever but they are not. They will ‘die’. The speed at which they will die is extremely slow, of course, from our perspective, but there are other perspectives which have alternative assessments of the passing of time. Cox, for example, argues for a different conception of time than the one that rules our lives. For him time on a universal scale is vastly different than how we perceive of time at the human scale. However, for him, that matters little. All time happens in the blink of an eye. My grandparents are dead. My parents are dead. I’m next in line. My children and grandchildren will follow me into the void. My life has passed in the blink of an eye. It really does seem that way to me. On a planetary scale, the Rocky Mountains will be gone in the blink of an eye as will the scars that crisscross the Alberta prairie. The locality reveals the presence of creatures originating from the Cambrian explosion, an evolutionary burst of animal origins dating 545 to 525 million years ago. During this period, life was restricted to the world’s oceans. The land was barren, uninhabited, and subject to erosion; these geologic conditions led to mudslides, where sediment periodically rolled into the seas and buried marine organisms. At the Burgess locality, sediment was deposited in a deep-water basin adjacent to an enormous algal reef with a vertical escarpment several hundred meters high. From ocean floor to mountain peak in a few million years. In fact, when the Burgess Shale was created, the planet looked entirely different than it does today. This map from the same website noted above shows that the continents were not yet formed as we know them. British Columbia has been carved up for the needs of humans, and some of those carvings are visible at 12,130 meters, but not in the same way as Alberta. BC has nowhere near the absolute symmetry of Alberta’s political-economic divisions. Mountains and prairies offer very different options for human interference. In a million years that human interference will not likely be evident at all. So, things come and go. People, mountains, plains, continents, planets, even universes. We are all finite. We all have our turn to get transmogrified with every atom of our bodies converted to other uses for other organisms. From that perspective, mountain ranges and prairies are no different from each of us as individuals. That’s life. Flying gets me thinking about these things. Growing grapes on the Beaufort Range. I live on one of the main roads that lead out of Cumberland, BC. Cumberland is on the eastern slopes of the Beaufort Range at about a 500 foot altitude. Over the past few weeks we have witnessed at least a dozen logging trucks headed out of town every week day down the Trent River Main headed who knows where. That’s been going on for years but it seems logging activity is picking up around here. Certainly, the clearcuts are getting bigger and bigger just up the slopes from our little community and they’re getting more numerous. I don’t know much about what sustains a forest. I’m a sociologist, not a biologist nor an ecologist. What the ecologists tell me, however, is frightening. Logging and development are wreaking havoc with ecosystems and changing the landscape in very visible ways. I’m of two minds about that. Should we care? But let me step back for a moment and ask a few questions some of you may have answers to. Given climate change and the report yesterday that increasing temperatures are accelerating, has anyone given thought to how a changing global climate will impact our forest and marshland ecosystems on Vancouver Island? Is there a tipping point where the amount of logging in any specific area will permanently change the local climate so that certain species of trees cannot grow here any longer? In the foreseeable future are we looking at the conditions ideal for growing grapes on the hillsides above Cumberland? Are we looking at a potential wine growing situation here? I know that logging in the Comox Valley and in most areas on the eastern slopes of Vancouver Island mountain ranges is proceeding apace. I’m not at all against logging per se. After all, I’m a woodworker and sculptor in wood. We also still burn wood on occasion in our wood stove. I do, however, question the logic of the kind of clearcut logging we’re witnessing here. There are many ways that forests can serve the economic interests of communities and I’m not at all sure that what’s happening here at the moment is in our best interests. There are alternatives, but I doubt that they are given serious consideration. Given that the mountain sides above us are all privately owned by logging companies who are themselves largely owned by pension funds, the current model is unlikely to change. Making pots of money is the name of the game and quarterly profits must increase or shareholders may look to invest their money elsewhere. I’m not sure pension managers know anything about logging or forestry, but they do know how to push for increased revenues. So, forestry managers must deliver the goods or risk losing their stake in the venture. In some ways I grieve the loss of the wonderful forests that surround us, but I also realize that the land hereabouts was pretty much clearcut a hundred years ago to resemble a barren landscape. We live in second and third growth tree plantations, not forests. I’m quite shocked at the size of much of the timber I see leaving on the trucks by my home. I can’t image many of the logs on those trucks would be of much use except to make pulp or chips for strandboard, nor can I image you’d get as much as a 2X4 out of some of them. That said, maybe I need to chill out and accept what’s happening. After all, I enjoy a nice Chardonnay. Maybe, soon enough, we’ll be a world class wine growing area with a balmy climate while California becomes a desert once again. Maybe we’ll have vineyards as far as the eye can see. Cheers! Maybe we can grow hops too!